Eat Beats in a brand new, forward thinking club/student night presented to you by a team of Manchester based promoters. Hosted by Sound Control Manchester the series of events will showcase the region's freshest up and coming talent in electronic music as well as championing established guest DJs and unsigned artists. Along with clued up students, it's a home for agents, artist's managers and festival representatives to come together to network and enjoy a diverse array of exciting talent and a good party! The ethos of the event is a collaborative, feel good party atmosphere with no fuss and no waiting in queues all night to get a drink, go to the toilet or have bouncers hassle you unnecessarily. With cheap drinks and entry combined with interactive competitions to win great prizes and most importantly a great variety of electronic music, Eat Beats is the new go-to midweek party in town. The launch night kicks off at Sound Control Manchester on Wednesday 27th April with Manchester based DJ/producer OLSEN representing in Room One. Making waves with his fusion of jazz and deep house beats, he released his debut album 'Totoro' last year on London-based house label Super Recordings (owned by Ninja Tune affiliate Raffertie). DJ duo UNDERSTATE also join the bill having created a buzz in the house scene with their bass-heavy tracks and energetic live sets merging house, techno and bass music. Picking up label interest their debut track 'Let It Go' featuring Gaby Henshaw was signed to one of the biggest dance label imprints Armada Deep. With warm up sets for the likes of Disclosure, Gorgon City and DJ EZ behind them, the guys have just released their new track 'Don't Stop' and latest mix for 20/20 Vision Recordings. Room One will also host a refreshing blend of music blend of music from house tunes to heavy energetic electronic beats from DARR alongside THC and ABBOTT. Room Two features a whole host of music from up and coming artists including HYPHEN, quickly becoming recognised across the UK within the bass scene he has played alongside artists such as General Levy and Kurupt FM to name a few. Joining Hyphen will be Manchester based multi-genre duo BRIX, with their own show on Fuse FM the duo will bring an energetic mix of future house and bass to Eat Beats. House and techno DJ HAZ MONEY, contemporary and world music artist AD HOC and student favourite CAMERON RAWSON will be providing tunes guaranteed to get you dancing. 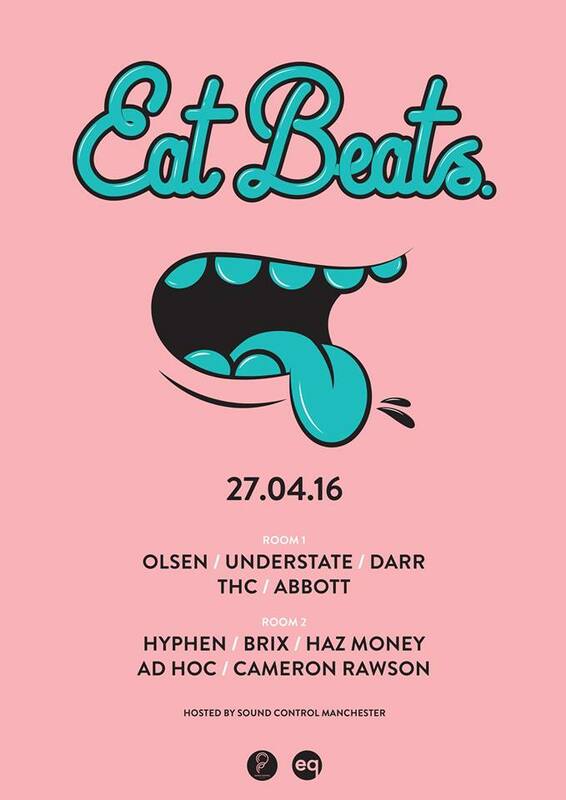 Eat Beats brings together Manchester's underground student scene and top music in a fast moving landscape with sounds covering house, techno, bassline, hip-hop, grime and everything in between. The events kick off with a monthly Wednesday, with the launch party on Wednesday 27th April.